George Robert Jay – Machine Gun Corps – Private – 35841 – Killed in Action 22nd April 1917 age 33 – Son of Robert Jay (deceased) and Mrs Ellen Cubberley (formerly Jay), Eagle Cottage, Langdon Hills and Brother of Walter above. 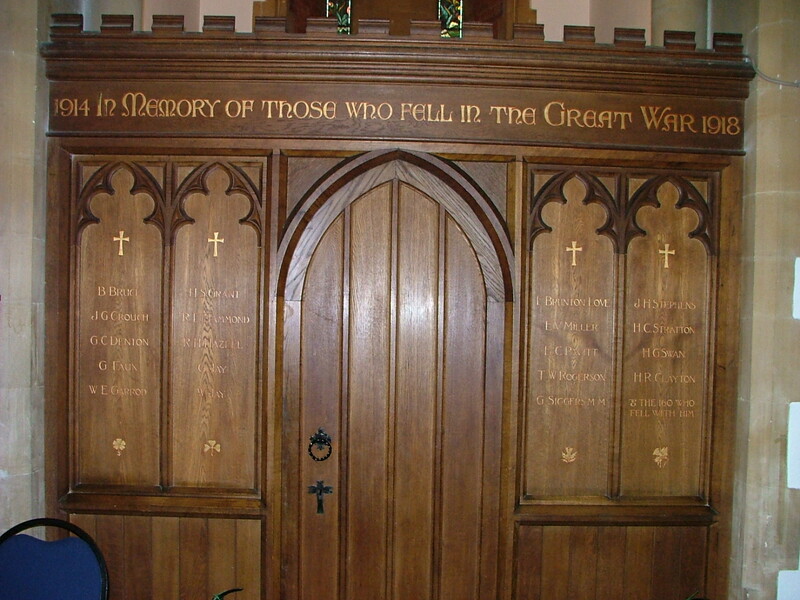 – Victory and British War Medals – Basra Memorial, Iraq and St Mary’s Church Memorial, Langdon Hills. Thomas Laws – 17th Battalion, King’s Royal Rifle Corps – Lance Corporal – 21507 – Killed in Action 18th April; 1918 age 21 – Son of Mr T and Mrs J Laws, Humberstone Road, Plaistow – Victory and British War Medals – Tyne Cot Memorial, Belgium and Langdon Hills (Laindon) Baptist Church Wall. 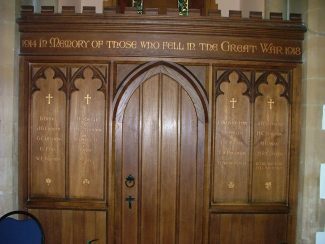 F Brunton Love – 39th Training Squadron – Flight Lieutenant – Killed 8th June 1918, flying accident age 19 – Cemetary, St Peter’s churchyard, Nevendon – Son of Charles and Agnes Love, Edes Lodge, Pitsea – St Mary’s Church War Memorial, Langdon Hills. Ernest Vivian Miller – 1st/18th Battalion, London Regiment (London Irish Rifles) – Rifleman – 2695 – Killed in Action 25th September 1915 age 19 – Son of Albert and Annie Millene, Ivydene, London Road, South Benfleet, formerly of Langdon Hills – 914/15 Star, Victory and British War Medals - Loos Memorial, France and St Mary’s Church War memorial. Ernest Charles Pavitt – 9th Battalion, Royal Fusiliers (City of London Regiment) – Private – 5083 – Killed in Action, 30th November 1917 age 32 – Husband of Gertrude Pavitt, 2 Nightingale Parade, Langdon Hills – 1914/15 Star, Victory and British War Medal – Cambrai Memorial, France and St Mary’s Church War Memorial. Thomas William Rogerson – 240th Artisan Works Company, Corps of Royal Engineers – Lance Corporal – 246023 – Killed in Action 24th August 1918 age 44 – Cemetery, Terlincthun British, France – Son of Frank and Mary Rogerson – Victory and British War Medals – St Mary’s Church War Memorial. George Siggers – A Battery 71st Brigade, Royal Field Artillery – Gunner- 9590 – Died of Wounds 8th February 1917 age 30 – Cemetery, St Sever Extension, France – Husband of Charlotte Siggers (nee Burr), Dry Street, Langdon Hills – Military Medal, 1914/5 Star, Victory and British War Medal – St Mary’s Church War Memorial. John Hay Stephens – Honourable Artillery Company (Infantry) – Private – 7276 – Killed in Action 21st April 1917 age 28 – Son of Charles and Mrs Stephens (deceased) and husband of Mrs B M Poultney, 828 Standard park Buildings, Vancouver, BC. Victory and British War Medals – Arras Memorial, France and St Mary’s Church War memorial. Harry Charles Stratton – Prince of Wale’s Own Civil Service Rifles ,London Regiment – Private – 531182 - Died at Home 31st May 1919 age 21 – Cemetery, St Marys and All Saints Old Church, Langdon Hills – Son of Harry and Agnes Stratton, High View, Butler’s Grove, Langdon Hills – Victory and British War Medals – St Mary’s Church War Memorial. Henry George Swan – 2nd Battalion, Essex Regiment – Private – 10028 – Killed in Action, 22nd November 1914 age 23 – Son of Walter and Ellen Swan, Thatched Cottage, Oxford Road, Langdon Hills – 1914/15 Star, Victory and British War Medals – Ploegsteert Memorial, Belgium and St Mary’s Church Memorial. Harold Tait Tavener – B Battery, 88th Brigade Royal Horse Artillery and Royal Field Artillery – 2nd Lieutenant – Died of woonds 12 April 1918 age 26 – Cemetery, Lijssenthock, Military, Belgium – Son of George and Elizabeth Tavener, 5 Egham Road, Plaistow – Victory and British War Medals.